I suffered from Tendonitis recently. If you’ve never had a brush with this writer’s curse, let me tell you it’s no fun – in fact, I found it rather excruciating. It was my own fault, of course – the way I use the mouse was, I think, was largely to blame. However the affliction hit me while I was in the middle of two feature articles, a short story and a few corporate writing assignments; in other words, I was busy! The prescribed treatment for the afflicted appendage is a fortnight’s rest, so this ‘righty’ was forced to become a ‘lefty’, at least where using a mouse was concerned. I also had to strap my right wrist in such a way as to prevent my hand bending back and forth – no easy thing. And then of course there was the drama of finding the right kind of wrist wrap. I initially trialled a slip-on compression sleeve – agony! I then moved on to a ‘Thermoskin’ with a built-in brace/splint. An initial mix-up by the chemist’s assistant saw a left-handed model strapped onto my right hand, making the bent brace/splint that is supposed to sit under your palm to prop it up do the reverse – meaning double the agony! Once the right model was fitted I was all smiles – well, as smiley as you can be with an aching wrist. The pain was fairly constant for a week before tailing off to something more bearable. Stoic, I shunned muscle relaxants, painkillers and topical creams. The only relief I gained was while in bed at night, and the back of my hand and wrist gently rested on a pillow. To look at, my wrist appeared no different, but beneath the skin the tendons throbbed and burned. It was a constant pain that would flare up when I temporarily forgot about the problem and twisted or wrenched my hand while drying myself with a towel, picking up a bag or opening a door. Some long-term ergonomic changes were required. 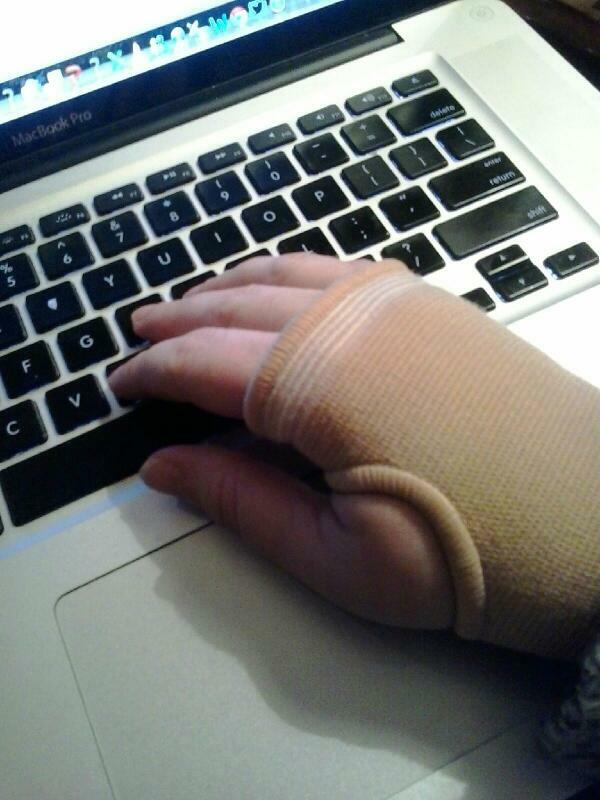 I now permanently use my left hand for the mouse. For the time being I will continue to strap my right wrist while writing to ‘train’ it to make use of the ergonomic gel mouse pad. After all, I don’t want this to develop into something worse like RSI. Look after your paws, people!